Cover of the first volume of World Trigger, featuring one of the main protagonists Yūma Kuga. 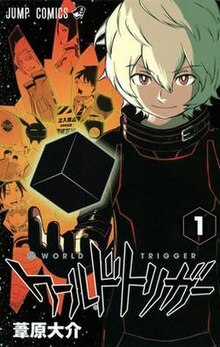 World Trigger (Japanese: ワールドトリガー, Hepburn: Wārudo Torigā), also known in short form as WorTri (Japanese: ワートリ, Hepburn: Wātori), is a Japanese manga series written and illustrated by Daisuke Ashihara, which was initially serialized in Weekly Shōnen Jump from February 2013 to November 2018, and later transferred in December 2018 to Jump Square. An anime adaptation of the series produced by Toei Animation started airing on October 5, 2014; the series ended on April 3, 2016. In Mikado City (三門市, Mikado-shi) (280 000 inhabitants), a "gate" to a different world suddenly opens one day. Monsters called "Neighbors" (近界民（ネイバー）, Neibā, lit. "Near-world people") start appearing from the gate. Humans are overwhelmed at first when their weapons are found to be useless against Neighbors, until a mysterious organization appears that is able to repel the Neighbors' attacks. The organization is called the National Defense Agency, or "Border," and has appropriated the Neighbor technology called "Triggers," which allows the user to channel an internal energy called Trion and use it as a weapon or for other purposes. By activating a trigger, the body of users is replaced by a battle-body made of trion which is stronger and more resistant. Members of Border are divided in three ranks, A, B, and C, with only the members of rank A possessing the most powerful triggers, comparable in strength to those of Neighbors. Four years later, people in Mikado City have grown used to the occasional battles with the Neighbors, and have returned more or less to their everyday lives. Border has become popular. One day, a mysterious white-haired student transfers to the local school, named Yūma Kuga (空閑 遊真, Kuga Yūma). Kuga is in fact a strong humanoid Neighbor, a fact that he wants to hide from Border. In the school he meets another student, Osamu Mikumo (三雲 修, Mikumo Osamu), who is secretly a C-class Border trainee. Since Kuga is completely oblivious about life in Mikado City, it falls to Mikumo to guide him through it, and to prevent him from being discovered by Border. The manga was written and illustrated by Daisuke Ashihara. Individual chapters have been serialized in Weekly Shōnen Jump since February 2013, and are collected into tankōbon volumes published by Shueisha. As of December 2018, nineteen volumes have been released in Japan. Viz Media has licensed the series. Due to health issues on the part of the author, it was put on hiatus after the 50th issue of 2016. The series returned in issue #48 of Weekly Shōnen Jump on October 29, 2018 and ran until issue #52 on November 26, then it was transferred to Jump Square on December 4, 2018. An anime adaptation of World Trigger was announced on May 27, 2014 and was to start airing in October 2014. On July 8, 2014, it was revealed that the anime adaptation would be produced by Toei Animation. On August 4, 2014, the anime's official website revealed the voice cast (in Japanese alphabetical order): Nobuhiko Okamoto, Rie Kugimiya, Hideyuki Tanaka, Nao Tamura, Jun Fukuyama, Tomo Muranaka and Yūki Kaji. It also revealed that the anime would be broadcast on TV Asahi. An event was held on Roppongi Hills Arena (TV Asahi's "Summer Festival" venue) revealing the full cast and the characters they would be playing. On August 6, 2014, the combined 37-38th issue of Weekly Shonen Jump revealed the roles for some of the cast, as well announcing the addition of Yūichi Nakamura as Yuichi Jin. On August 11, 2014, the official website for the anime was updated to reveal the rest of the cast members' roles and a PV for the anime was posted. On August 20, 2014, Weekly Shōnen Jump's 39th issue revealed more of the anime's cast. On August 25, 2014, the anime's official website revealed the anime would premier in October 5, 2014. On August 29, Weekly Shōnen Jump's 39th issue revealed the staff, with Mitsuru Hongo directing the anime at Toei Animation with series composition by Hiroyuki Yoshino. Toshihisa Kaiya and Hitomi Tsuruta were announced as character designers and animation directors, and Kenji Kawai composing the music for the soundtrack. The series was slated to run for 50 episodes, but ended up having 73 episodes. On September 10, it was revealed that the Nagoya trio Sonar Pocket would perform the anime's opening theme, "GIRIGIRI" (ギリギリ, lit. "Borderline"). Like in most of the TV anime that are broadcast on TV Asahi in Japan, the World Trigger anime incorporates all the credits into the opening theme and there is only an opening for the show and no ending for the show. In summer 2015, the "World Trigger Natsu Matsuri 2015" (World Trigger Summer Festival 2015) event announced World Trigger: Isekai Kara no Tōbōsha, a brand new series with an original story not presented in the World Trigger manga, and with new characters and concepts. This "new series" actually ended up being the "Fugitve Arc" of the anime, which ran from Episodes 49 to 63. In July 2015, it was announced that Toei would be producing an English dub with Ocean Productions. The series began airing in the United States on Primo TV on January 16, 2017. On March 7, 2016, it was confirmed that the World Trigger anime would end, after it was announced that TV Asahi would be replacing the time slot airing it with sports programming. A PlayStation Vita action game developed by Artdink titled World Trigger: Borderless Mission was released in Japan on September 17, 2015. An iOS and Android game developed by Ganbarion titled World Trigger: Smash Borders was released on July 21, 2015. It was later released on PlayStation Vita on February 17, 2016. Both were published by Bandai Namco Games. In the year of 2016, a survey conducted by Oricon found that World Trigger was the 18th best-selling manga, with about 2,234,851 copies sold. Rebecca Silverman of Anime News Network said that "World Trigger is an exciting read that distributes its information organically rather than relying on info-dumps." In a 2016 reader's poll on goo, the series ranked the fifth most likely to become a Weekly Shonen Jump signature series. The series ranked 10th in the Tokyo Anime Award Festival's top 100 TV anime series of 2016. During NHK'S top 100 anime voting, World Trigger placed 158 out of 400, tied with Detective Conan: The Darkest Nightmare. ^ "The Official Website for World Trigger". Viz Media. Archived from the original on July 2, 2017. Retrieved October 28, 2017. ^ "Viz Media Announces Print Edition for World Trigger Manga". Anime News Network. April 18, 2014. Archived from the original on November 12, 2014. Retrieved November 9, 2014. ^ "World Trigger Manga Goes on Indefinite Hiatus Due to Author's Poor Health". Anime News Network. November 17, 2016. Archived from the original on May 17, 2017. Retrieved May 14, 2017. ^ "World Trigger Manga Resumes on October 29". Anime News Network. October 14, 2018. Retrieved October 15, 2018. ^ "Shonen Jump's World Trigger Manga Gets Anime". Anime News Network. Retrieved May 27, 2014. ^ "World Trigger TV Anime Slated to Premiere in October". Anime News Network. Archived from the original on June 24, 2014. Retrieved June 24, 2014. ^ "Toei Animation Produces "World Trigger" TV Anime Adaptation". Crunchyroll. Archived from the original on July 12, 2014. Retrieved July 8, 2014. ^ "Yuuki Kaji, Nobuhiko Okamoto, Rie Kugimiya Star in World Trigger Anime". Anime News Network. Archived from the original on August 5, 2014. Retrieved August 4, 2014. ^ "Yūichi Nakamura Joins World Trigger TV Anime Cast". Anime News Network. August 6, 2014. Archived from the original on August 8, 2014. ^ "World Trigger Gets Commemorative Video for Upcoming Anime". Anime News Network. August 11, 2014. Archived from the original on August 13, 2014. ^ "Tomoaki Maeno, Masakazu Morita, Kana Hanazawa Join World Trigger Cast". Anime News Network. August 20, 2014. Archived from the original on July 12, 2015. ^ "Anime's premiere date". Toei Animation. Archived from the original on September 3, 2014. Retrieved August 25, 2014. ^ "Outlaw Star's Mitsuru Hongo Directs World Trigger Anime". Anime News Network. Archived from the original on September 1, 2014. Retrieved August 29, 2014. ^ "World Trigger Anime Listed With 50 Episodes". Anime News Network. Archived from the original on January 7, 2015. Retrieved January 28, 2015. ^ "主題歌にソナーポケットの新曲「GIRIGIRI」が決定！！コメントも到着！" (in Japanese). Toei Animation. Archived from the original on September 11, 2014. Retrieved September 11, 2014. ^ "World Trigger TV Anime Gets New Series in October". Anime News Network. Archived from the original on 2016-05-17. Retrieved 2016-05-27. ^ "Toei Screens 1st 3 World Trigger Episodes with English Dub". Anime News Network. 2015-07-03. Archived from the original on 2017-06-24. Retrieved 2017-01-24. ^ "World Trigger Anime's Main English Dub Cast Revealed". Anime News Network. 2016-04-21. Archived from the original on 2016-12-21. Retrieved 2017-01-24. ^ "Bilingual Hispanic Channel To Feature "World Trigger" Anime". Crunchyroll. 2017-01-24. Archived from the original on 2017-01-26. Retrieved 2017-01-24. ^ Green, Scott (March 7, 2016). ""World Trigger" Anime Wraps Up In March". Crunchyroll. Archived from the original on March 7, 2016. Retrieved March 7, 2016. ^ "World Trigger game announced for PS Vita". Gematsu. Archived from the original on December 9, 2014. Retrieved December 11, 2014. ^ "World Trigger game announced for iOS and Android". Dengeki Online - Dengeki App. Archived from the original on April 8, 2015. Retrieved April 6, 2015. ^ Romano, Sal (February 17, 2016). "World Trigger: Smash Borders for PS Vita now available in Japan". Gematsu. Archived from the original on March 12, 2017. Retrieved January 24, 2017. ^ "Top-Selling Manga in Japan by Series: 2016 (First Half)". Anime News Network. Archived from the original on June 21, 2016. Retrieved June 19, 2016. ^ "World Trigger GN 1 - Review". Anime News Network. Archived from the original on April 4, 2016. Retrieved June 19, 2016. ^ Green, Scott (December 28, 2016). "Japanese Readers Suggest Which Manga Will Be Next "Shonen Jump" Signature Series". Crunchyroll. Archived from the original on January 26, 2017. Retrieved January 23, 2017. ^ Komatsu, Mikikazu (December 28, 2016). "Tokyo Anime Award Festival Announced Top 100 Anime of 2016". Crunchyroll. Archived from the original on December 29, 2016. Retrieved October 21, 2017. ^ "ベスト･アニメ100投票結果発表｜ニッポンアニメ100｜NHK". NHK. Archived from the original on 2017-10-07. Retrieved October 22, 2017. Douresseaux, Leroy (September 25, 2014). "World Trigger: Volume 1 Advanced manga review". Comic Book Bin. Toon Doctor. Douresseaux, Leroy (October 6, 2014). "World Trigger: Volume 2 Advanced manga review". Comic Book Bin. Toon Doctor. Douresseaux, Leroy (February 25, 2015). "World Trigger: Volume 4 manga review". Comic Book Bin. Toon Doctor. Douresseaux, Leroy (March 29, 2015). "World Trigger: Volume 5 manga review". Comic Book Bin. Toon Doctor. Douresseaux, Leroy (August 24, 2015). "World Trigger: Volume 6 manga review". Comic Book Bin. Toon Doctor. Douresseaux, Leroy (October 28, 2015). "World Trigger: Volume 7 manga review". Comic Book Bin. Toon Doctor. Douresseaux, Leroy (January 25, 2016). "World Trigger: Volume 8 manga review". Comic Book Bin. Toon Doctor. Douresseaux, Leroy (April 29, 2016). "World Trigger: Volume 10 manga review". Comic Book Bin. Toon Doctor. Luster, Joseph (April 28, 2015). "Manga Review: World Trigger vol. 5". Otaku USA. Sovereign Media. Surat, Daryl (January 17, 2016). "[Review] World Trigger". Otaku USA. Sovereign Media. Warner, Matthew (November 11, 2014). "World Trigger Vol. #01 Manga Review". The Fandom Post. Warner, Matthew (November 20, 2014). "World Trigger Vol. #02 Manga Review". The Fandom Post. Warner, Matthew (January 26, 2015). "World Trigger Vol. #03 Manga Review". The Fandom Post. Warner, Matthew (January 26, 2015). "World Trigger Vol. #04 Manga Review". The Fandom Post. Warner, Matthew (July 11, 2015). "World Trigger Vol. #05 Manga Review". The Fandom Post. Warner, Matthew (December 12, 2015). "World Trigger Vol. #07 Manga Review". The Fandom Post. Warner, Matthew (March 27, 2016). "World Trigger Vol. #08 Manga Review". The Fandom Post. Warner, Matthew (August 19, 2016). "World Trigger Vol. #10 Manga Review". The Fandom Post. Taylor, Jarrius (October 5, 2014). "World Trigger Episode #01 Anime Review". The Fandom Post. This page was last edited on 16 April 2019, at 20:39 (UTC).